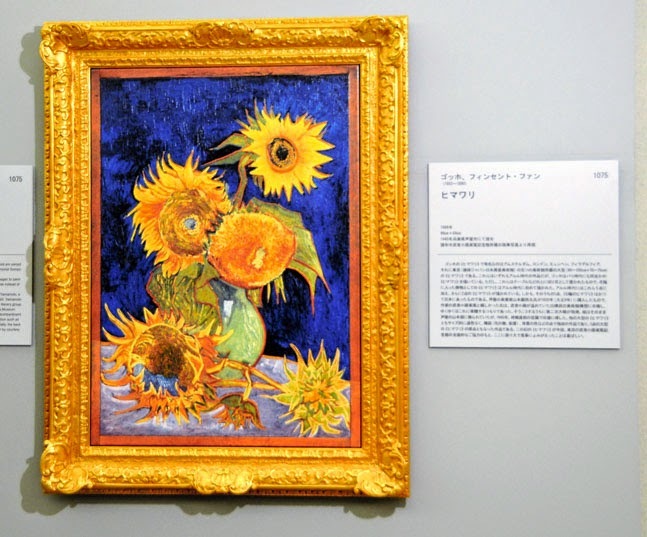 NARUTO, Tokushima Prefecture--A painting in Vincent van Gogh's iconic "Sunflowers" series destroyed in a World War II air raid has been brought back to life by a museum here that specializes in reproducing Western masterpieces. 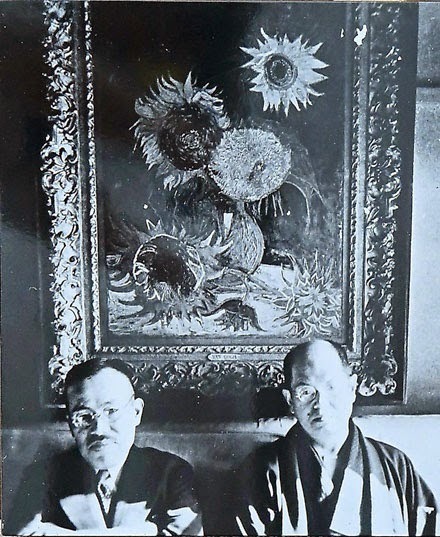 The work, called "Ashiya sunflowers," was painstakingly recreated on porcelain board by the Otsuka Museum of Art and went on permanent display at the gallery on Oct. 1. The painting was originally purchased in 1920 from a seller in France by Koyata Yamamoto, a wealthy businessman from Ashiya, Hyogo Prefecture. He paid the equivalent of 200 million yen today ($1.69 million) for the piece, one of seven versions produced by van Gogh (1853-1890). Yamamoto intended to donate the work to a museum to be established by such figures as writer Saneatsu Mushanokoji. However, before the plan was realized, the work was destroyed in a fire that started from U.S. air raids over western Japan on Aug. 6, 1945. The museum has employed tile-production techniques to make porcelain replicas of many famous paintings in its collection of 1,000 such replicas. However, it was the museum's first attempt to reproduce a painting that no longer exists. The work was launched in April by Otsuka Ohmi Ceramics Co., based in Koga, Shiga Prefecture, at its plant in Shigaraki. Referring to a color art book owned by Tokyo's Mushanokoji Saneatsu Memorial Museum, the craftspeople copied an image of the original painting onto porcelain board using an ink that becomes transparent when fired. They then applied and fired a glaze to produce the same uneven surface as the painting. On top of this they painstakingly made a copy of the original using a special color sheet. The workers manually applied finishing touches, then fired the tile again to complete the process. As the company was working without an original, getting the luster and texture of the original proved difficult. Three prototypes were made for a job that normally requires one. "Many renowned pieces have either been stolen or lost in natural disasters," said Chiyoko Asai, the museum's chief curator. 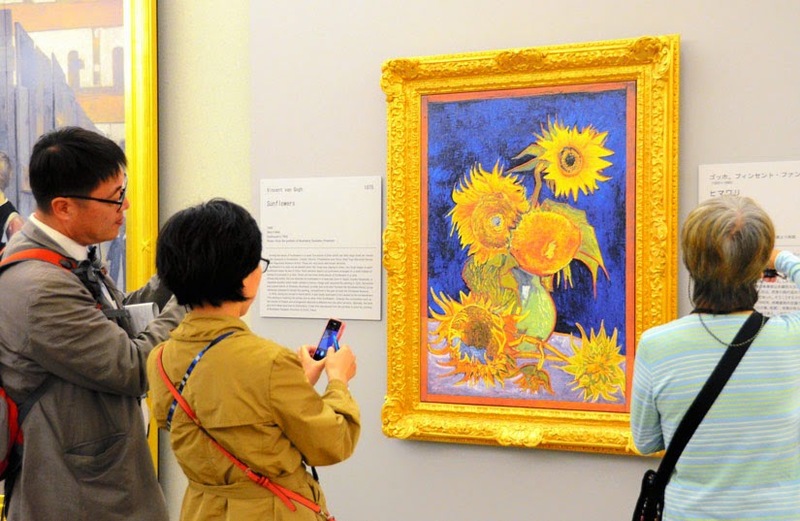 "We hope to use this experience (of recreating the 'Sunflowers' painting) for future projects." This is a blog about what interests me. Here you will find stories on animals, including animal rights material, cute stuff, and random informative posts about weird, beautiful and interesting creatures. Horses, Spotted Hyenas, and Border Collies will make regular appearances. Also prominently featured will be posts about the Arts. Animation, photography, and the traditional forms, plus "outsider art," film and books. Other things that will surface here are Japan & the Japanese, John Oliver, surfing, skateboarding and My Little Pony: Friendship Is Magic, interesting places and structures,and my own art, writing and photography. There will be rants. It's an election year, and I am beginning to have a political dimension to my personality. I am also horrified at the level of injustice and violence visited upon people here in the US and elsewhere - particularly against people of color, immigrants, and the LGBT community. Some of these stories will be very hard to read, but I believe we must read them to keep ourselves mindful of the racist and vicious things that happen every day, to speak out when we see discrimination, and root out its evil from ourselves. This Is In My Back Yard? Litter Box, What Litter Box? How Long Is the Road Home from War?